The leader of Malian Islamist group Ansar Dine, Iyad Ag Ghaly, has a complex and colourful past. 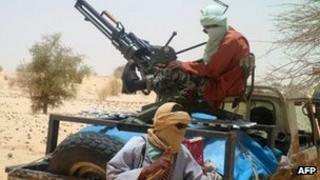 He has led Tuareg uprisings against the Malian government, acted as go-between in securing the release of hostages kidnapped by al-Qaeda, and spent time as a Malian diplomat in Saudi Arabia. A little-known figure who rarely speaks to the press, Mr Ghaly's motivation for founding Ansar Dine remains the subject of some debate. He comes from the Ifoghas tribe and the Kidal region of north-eastern Mali. Believed to be now in his mid-fifties, he first came to public attention in the early 1990s as the leader of a Tuareg revolt seeking independence or greater autonomy for the northern region of Mali that they call Azawad. Malian state radio referred to him in 1991 as the secretary-general of the Popular Movement of Azawad and head of the delegation negotiating an end to the rebellion with the government. In 1995 Radio France International called him the "undisputed leader" of the Tuareg rebels. After another, short-lived revolt in 2006, Mr Ghaly became head of a movement called the 23 May Democratic Alliance for Change. The following year he was reported to be a member of the Malian High Council of Territorial Collectivities. In August 2003 he played the key role in securing the release of 14 mostly German tourists kidnapped by the Algerian Salafi Group for Call and Combat, GSPC, which later became Al-Qaeda in the Islamic Maghreb (AQIM). He negotiated further hostage releases in 2008, 2010 and 2011. Although European governments denied paying ransoms, these kidnappings are believed to have earned GSPC/AQIM tens of millions of dollars. A US diplomatic cable released by Wikileaks referred to Mr Ghaly as turning up "like the proverbial bad penny" whenever there was the prospect of "a cash transaction" between the Tuareg and a foreign government. Between late 2007 and early 2010 he held a post at the Malian consulate in Jedda, Saudi Arabia, although at times during this period he was reported as being in Mali and elsewhere negotiating hostage releases. Several Malian press reports say he left this post after Saudi Arabia declared him persona non grata for having contact with terrorist elements. After the collapse of the Gaddafi regime in Libya in mid-2011, Mr Ghaly reportedly sought the leadership of the National Movement for the Liberation of Azawad (MNLA), newly-formed by returning Tuareg who had served in the Libyan army, but he was rebuffed. An MNLA official told Le Monde in April 2012 that this was because of links with AQIM, but that it was unclear whether this association was "out of conviction or out of opportunism". Other sources say Mr Ghaly was rejected because of his "close ties" with the Malian government, a suspicion which dates back to the rebellion of 1990, when he was seen as having compromised in the course of negotiations. Mr Ghaly has also faced problems within the Ifoghas tribe. After reportedly being overlooked during a takeover of leadership of the tribe in 2011, he was then condemned by the tribal chief and religious leaders for his "personal project", Ansar Dine. The pro-MNLA website Toumastpress reported that the tribal chief asked Ansar Dine to lay down their arms or leave the region. Mr Ghaly's establishment of Ansar Dine could be seen as a response to setbacks he experienced in the internal Tuareg power struggle, but alongside this Tuareg nationalism one can also trace the development of strong religious beliefs. He is said to have been attracted to the teachings of a Muslim missionary group, Tablighi Jama'at, which is non-political and condemns violence. He also spent some time in 2002 studying at a mosque in Saint Denis in France. His subsequent interactions with GSPC/AQIM and his time in Saudi Arabia may have moved his religious orientation in a more hard-line direction. In 2011 he reportedly told the Ifoghas tribal meeting that he wanted to impose Islamic law on the Tuareg. After Ansar Dine's seizure of Timbuktu in April 2012, Mr Ghaly made a statement on the local radio in which he announced "jihad against the opponents of the Sharia" and "enmity to the unbelievers and polytheists". He also called on the local inhabitants to assist Ansar Dine in "establishing the religion, spreading justice, security and ruling between people with justice, and promoting virtue and preventing of vice". It is difficult to ascertain his motivation for founding Ansar Dine because reliable, first-hand information about him is scarce, and conspiracy theories abound. One of these theories sees Mr Ghaly and AQIM as tools of the Algerian (and even US) security services. Another considers him a long-term collaborator with the Malian government. The depth of his adherence to the Islamist cause remains to be seen. As the recent experience in Yemen of Al-Qaeda in the Arabian Peninsula has shown, when a jihadist group seeks to hold populated areas it leaves itself open to a concerted military counteroffensive with international support. By adding the Islamist banner to his status among the Tuareg, Mr Ghaly may just be manoeuvring himself into a position from which he can emerge, as in the past, as the deal-maker.